Is it getting spooky yet, crafty friends? Halloween is just a week away, so I thought for those of you who don't want to buy stamps specifically for this occasion, but still have a card to scare someone, what can you do? 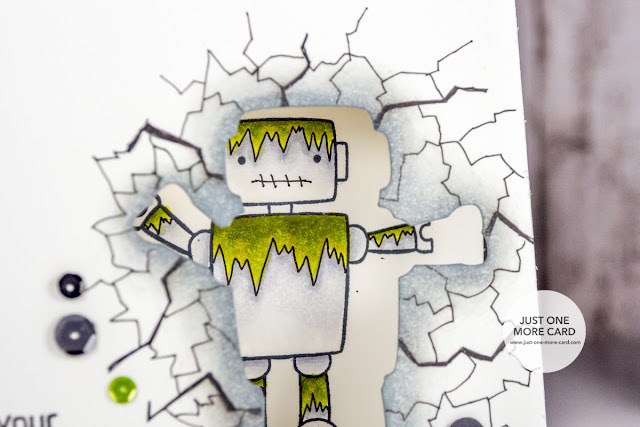 I am happy to report that you can rather easily turn almost any critter or character stamp into a scary zombie or mummy with some really easy "additions" – no special drawing skills required! As you can see, my otherwise cute robot turned into a rather menacing terminator – come to think of it, I should have given him a glowing red eye to complete the effect :D All that was needed was a Copic multiliner (since I was coloring with my Copics) and some patience. 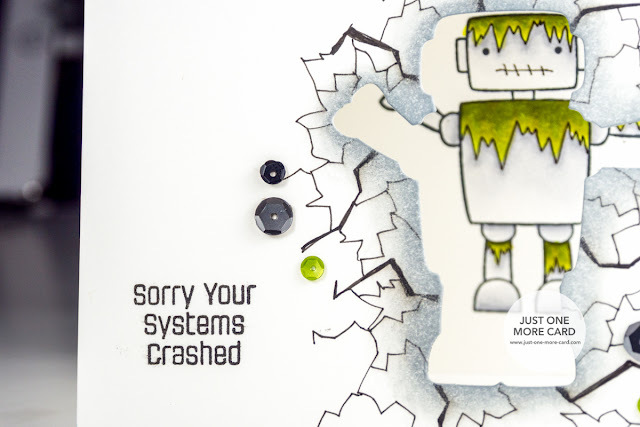 And yes, I did practice on a scrap piece of paper before I did this on the card. I'm not good enough get this done properly on the first attempt. I also always wanted to create a window card where the actual image is on the inside, and I was so happy to finally make a card like this. But the outside seemed a bit empty, so I drew in a cracked surface – no scientific method to it, I simply looked at images from the web how a cracked surface could look like and then drew squiggles. Really. And I also added some depth by sponging the inner die cut border to have more contrast to the terminator robot inside (you really want to remember to place something protective over the inside of the card, though!). And the sentiment I added – it made me laugh out loud, it seemed so fitting! Wow Julia, I really love this. 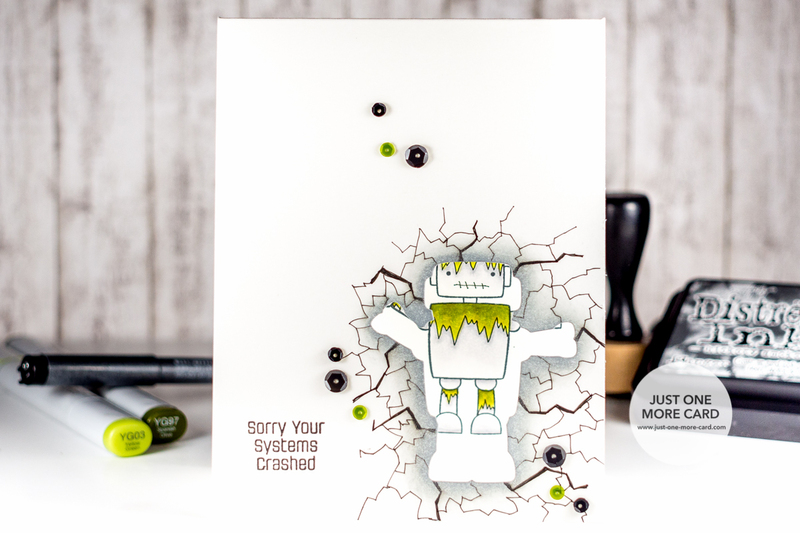 Even though I am not a fan of geeky stuff, I think this is an ingenious card. Love the colours too! Really great card Julia, the cracked walll is ingenious! Good ideas for stamp stretching too. Made me smile on a cold grey morning!